To understand the function that esophagogastric devascularization and transection (EDT) serves, an understanding of the underlying anatomy that results in esophagogastric varices must be understood. The coronary vein and gastric veins are connected to tributaries of the superior vena cava by collateral channels in the submucosa of the esophagus, between the two muscular layers, and in the periesophageal area (adventitial plexus). This represents a conduit between the portal and systemic system. In portal hypertension, there is abnormal upward and increased flow through this system, creating large dilated venous varices. The goal of the esophagogastric devascularization procedures is to disconnect the esophagus and stomach from this collateral system while maintaining a portosystemic shunt in place via the adventitial plexus surrounding the esophagus. Myriad nonshunting surgical techniques used to correct esophageal varices have been described in the literature. After the initial description in 1973, this technique was modified by Peracchia et al in 1980 to involve only a single abdominal incision and the use of circular stapling devices for esophageal transection. This appears to be a variation of techniques described earlier. In 1967, Hassab described esophagogastric devascularization via a single abdominal incision without esophageal transection. In 1974, Vankemmel first used a circular stapling device for performing esophageal transection. This procedure continues to be modified in subtle ways by a multitude of surgeons. [4, 5] The goal of all these procedures is to treat variceal bleeding without the encephalopathy and liver failure associated with decompressive surgical shunts. The approach chosen should be based on the experience and comfort level of the operating surgeon. Nonetheless, a pure abdominal approach is generally performed. Currently, there are few indications for EDT in the Western Hemisphere for the treatment of esophageal varices in patients with cirrhosis. American Association for the Study of Liver Diseases (AASLD) practice guidelines have not included devascularization procedures in their recommendations in the acute or prophylactic setting. Recommendations include nonselective beta blockade with endoscopic ligation therapy for prophylaxis and episodes of rebleed. If these therapies fail, transjugular intrahepatic portosystemic shunt (TIPS)  or selective shunt is considered. The goal is a bridge to liver transplantation whenever possible. EDT is absolutely contraindicated in patients who are unstable or medically unfit to undergo a surgical procedure. EDT is relatively contraindicated in Child C cirrhosis and when other treatment options for esophageal varices are not exhausted. EDT procedures should be performed only by specially trained surgeons who have previous experience with the procedure in a hospital equipped to handle complicated surgical intensive care unit (SICU) patients. In the elective setting, patients should undergo preoperative evaluation by a cardiologist and hepatologist. The patient should have hopefully developed a working relationship with his or her hepatologist prior to arriving at the decision to perform EDT. Such patients should be cross-matched, with packed red blood cells available. Platelets and fresh frozen plasma should be available. If the prothrombin time is elevated on preoperative testing, fresh frozen plasma may be infused prior to or at the start of the procedure. Perioperative mortality figures vary among series and differ depending on whether the procedure is performed in the elective or emergency setting. Garcia-Tsao G, Bosch J. 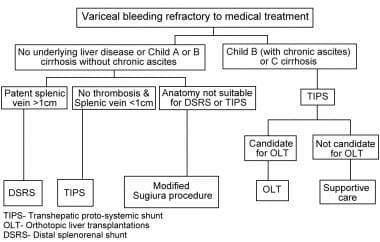 Management of varices and variceal hemorrhage in cirrhosis. N Engl J Med. 2010 Mar 4. 362 (9):823-32. [Medline]. Sugiura M, Futagawa S. A new technique for treating esophageal varices. J Thorac Cardiovasc Surg. 1973 Nov. 66 (5):677-85. [Medline]. Peracchia A, Ancona E, Battaglia G. A new technique for the treatment of esophageal bleeding in portal hypertension. Int Surg. 1980 Sep-Oct. 65 (5):401-4. [Medline]. Yu H, Guo S, Wang L, Dong Y, Tian G, Mu S, et al. Laparoscopic Splenectomy and Esophagogastric Devascularization for Liver Cirrhosis and Portal Hypertension Is a Safe, Effective, and Minimally Invasive Operation. J Laparoendosc Adv Surg Tech A. 2016 Jul. 26 (7):524-30. [Medline]. Zuiki T, Hosoya Y, Sakuma Y, Hyodo M, Lefor AT, Sata N, et al. Laparoscopic gastric devascularization without splenectomy is effective for the treatment of gastric varices. Int J Surg Case Rep. 2016. 19:119-23. [Medline]. [Full Text]. Su AP, Zhang ZD, Tian BL, Zhu JQ. Transjugular intrahepatic portosystemic shunt versus open splenectomy and esophagogastric devascularization for portal hypertension with recurrent variceal bleeding. Hepatobiliary Pancreat Dis Int. 2017 Apr. 16 (2):169-175. [Medline]. Garcia-Tsao G, Sanyal AJ, Grace ND, Carey W, Practice Guidelines Committee of the American Association for the Study of Liver Diseases., Practice Parameters Committee of the American College of Gastroenterology. Prevention and management of gastroesophageal varices and variceal hemorrhage in cirrhosis. Hepatology. 2007 Sep. 46 (3):922-38. [Medline]. Ginsberg RJ, Waters PF, Zeldin RA, Spratt EH, Shandling B, Stone RM, et al. A modified Sugiura procedure. Ann Thorac Surg. 1982 Sep. 34 (3):258-64. [Medline]. Shah SR, Nagral SS, Mathur SK. Results of a modified sugiura's devascularisation in the management of "unshuntable" portal hypertension. HPB Surg. 1999. 11 (4):235-9. [Medline]. Selzner M, Tuttle-Newhall JE, Dahm F, Suhocki P, Clavien PA. Current indication of a modified Sugiura procedure in the management of variceal bleeding. J Am Coll Surg. 2001 Aug. 193 (2):166-73. [Medline]. Makdissi FF, Herman P, Pugliese V, de Cleva R, Saad WA, Cecconello I, et al. Long-term results of esophagogastric devascularization and splenectomy associated with endoscopic treatment in schistosomal portal hypertension. World J Surg. 2010 Nov. 34 (11):2682-8. [Medline]. Costa Lacet CM, Neto JB, Ribeiro LT, Oliveira FS, Wyszomirska RF, Strauss E. Schistosomal portal hypertension: Randomized trial comparing endoscopic therapy alone or preceded by esophagogastric devascularization and splenectomy. Ann Hepatol. 2016 Sep-Oct. 15 (5):738-44. [Medline]. da Silva-Neto Wde B, Quireze-Júnior C, Tredicci TM. Late results of esophagogastric devascularization and splenectomy associated with endoscopic treatment in patients with schistosomiasis. Arq Bras Cir Dig. 2015 Jul-Sep. 28 (3):197-9. [Medline]. [Full Text]. Sugiura M, Futagawa S. Esophageal transection with paraesophagogastric devascularizations (the Sugiura procedure) in the treatment of esophageal varices. World J Surg. 1984 Oct. 8 (5):673-9. [Medline]. Orozco H, Mercado MA, Takahashi T, Hernández-Ortiz J, Capellán JF, Garcia-Tsao G. Elective treatment of bleeding varices with the Sugiura operation over 10 years. Am J Surg. 1992 Jun. 163 (6):585-9. [Medline]. Mathur SK, Shah SR, Soonawala ZF, Karandikar SS, Nagral SS, Dalvi AN, et al. Transabdominal extensive oesophagogastric devascularization with gastro-oesophageal stapling in the management of acute variceal bleeding. Br J Surg. 1997 Mar. 84 (3):413-7. [Medline]. Qazi SA, Khalid K, Hameed AM, Al-Wahabi K, Galul R, Al-Salamah SM. Transabdominal gastro-esophageal devascularization and esophageal transection for bleeding esophageal varices after failed injection sclerotherapy: long-term follow-up report. World J Surg. 2006 Jul. 30 (7):1329-37. [Medline]. Triger DR, Johnson AG, Brazier JE, Johnston GW, Spencer EF, McKee R, et al. A prospective trial of endoscopic sclerotherapy v oesophageal transection and gastric devascularisation in the long term management of bleeding oesophageal varices. Gut. 1992 Nov. 33 (11):1553-8. [Medline]. Ni YB, Gao PJ, Wang D, Li Z, Zhu JY. Esophagogastric devascularization without splenectomy in portal hypertension: safe and effective?. Hepatobiliary Pancreat Dis Int. 2015 Jun. 14 (3):276-80. [Medline]. Han J, Yi Y, Ding H, Liu J, Zhang Y, Hu L, et al. [Preoperative risk factors of portal venous thrombosis after splenectomy and gastric pericardial devascularization for portal hypertension]. Zhonghua Gan Zang Bing Za Zhi. 2014 Oct. 22 (10):739-43. [Medline]. Mariette D, Smadja C, Borgonovo G, Grange D, Franco D. The Sugiura procedure: a prospective experience. Surgery. 1994 Mar. 115 (3):282-9. [Medline]. Modified Sugiura procedure. Transection and anastomosis with EEA stapler. Current indication of modified Sugiura procedure in management of variceal bleeding.